Aretha Franklin was about a month shy of her 20th birthday when she appeared for a week at The Village Gate in late February of 1962. She shared a bill there with pianist and composer Thelonious Monk, who like her was an indescribable talent — a genius, in the fullest sense of the word — recently signed to the roster of Columbia Records. Franklin, who died Thursday at 76, solidified her unchallenged reign as the Queen of Soul elsewhere, on grander stages, typically with grittier musical backing. But she wasn’t out of place at The Village Gate, nor really out of her element. For the previous couple of years she’d been working comparable rooms in New York with a swinging piano trio. Months later, that July, she’d sing with the Duke Ellington Orchestra at the Newport Jazz Festival. Her Columbia output leaned into jazz as a signal of adult-pop sophistication, but also as an unforced affinity, less formative than the black church but just as inextricable, and maybe almost as deep. Jazz was central to her musicianship, however far she rambled. Without it we’d be remembering a different artist now, and celebrating a different body of work. On an even more basic level, Franklin was in some sense a jazz singer, even though that label captures neither the essence of her artistry nor the scope of her significance. In 1961 she was anointed “New-Star Female Vocalist” in the DownBeat critics poll, a measure of consensus for the jazz press. (She’d received 30 votes to Abbey Lincoln’s 25.) “The dimly lit, smoke-filled jazz club was taking on the aspect of a revival tent,” wrote Pete Welding in the accompanying profile, describing a Franklin performance almost as a kind of transubstantiation. You’re sure to read, in every good obituary of Franklin, that she grew up around jazz in Detroit. Still, it’s hard to capture the extent of this contact in passing. The best resource we have outside the music itself is Respect: The Life of Aretha Franklin, the 2014 biography by David Ritz, who’d previously collaborated with Franklin on her book Aretha: From These Roots. Franklin took offense at Respect, which she pronounced “a trashy book.” But through his interviews with members of her family, Ritz unearths invaluable insight about her musical moorings. Aretha’s father, the Rev. C.L. Franklin, was a Detroit institution who was close to Dinah Washington, and many a night passed where jazz legends gathered around the family piano: Ellington, Oscar Peterson, Nat King Cole, even Art Tatum. So as a girl, Aretha had not only prodigious talent but also extraordinary access. Her jazz influences were close at hand, as a pianist as well as a vocalist. Her older brother Cecil, who was close friends with Smokey Robinson, ran a barbershop out of the first-floor bathroom of their house. He took pride in the music he played in the shop: all the hip modern jazz of the day, from Mingus to Miles to Monk. Aretha would absorb it all. Hammond, who had famously worked with Holiday, saw this potential when he signed Franklin to Columbia. 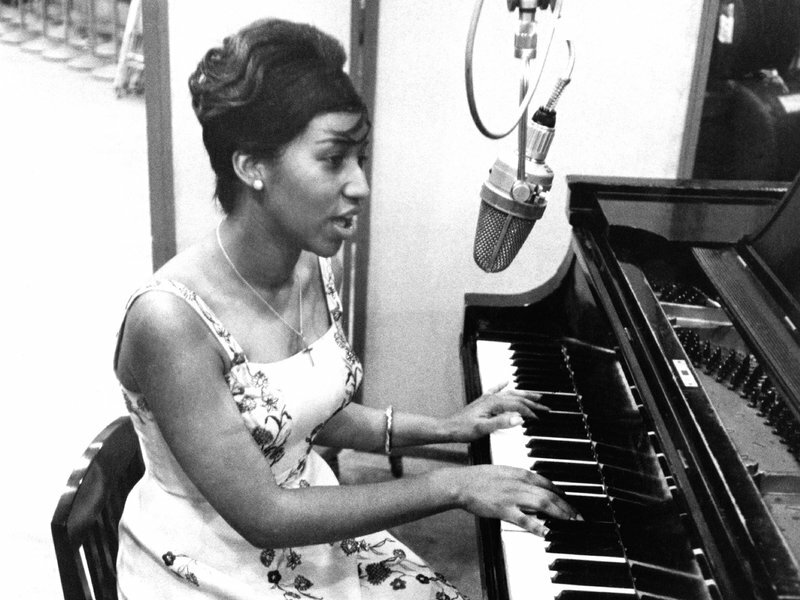 It was no accident that her first album for the label, released in ’61, was Aretha: With The Ray Bryant Combo — Bryant being an exceptional jazz pianist from Philadelphia, and the son of an ordained minister. Throughout that album, especially on a churchified track like “Won’t Be Long,” you can clearly hear the spark that would later be so celebrated. Jazz singing, idiomatically speaking, would be a flickering constant on the albums that followed: While it may be true to suggest that Franklin hadn’t yet found her lane, she was already very much driving her own car. Laughing on the Outside, released in 1963, opens with a spectacular reading of the Hoagy Carmichael standard “Skylark,” set at a swaying tempo, with an inspired, jolting octave leap in the final pass of the verse. There’s some incredible footage of Franklin performing “Skylark” and other songbook fare, like “Lover Come Back to Me,” on The Steve Allen Show in 1964. She’s ostensibly there to promote her latest album, Unforgettable: A Tribute to Dinah Washington, but she doesn’t do any of that material. What she does is riveting, bordering on sublime. More than a few jazz musicians of our time have shared a stage with Franklin, in settings as unfussy as Baker’s Keyboard Lounge and as exalted as The Kennedy Center. Two years ago I saw her perform at the White House, as part of the festivities around International Jazz Day. Part of what I remember is her tribute to Prince, who had died about a week earlier. Backed by jazz musicians, she sang “Purple Rain” — by which I mean she skipped right to the chorus, and made it feel like a sanctified refrain. But earlier, at the top of the program, she’d sat at the piano to perform Leon Russell’s “A Song For You,” backed by Herbie Hancock on keyboards, Christian McBride on bass and Brian Blade on drums. It turns out that this is the Franklin performance to remember from that evening. “You are a friend of mine,” she sang, redrawing the shape of the line, and making the most formal and public of presentations feel scarily intimate, like a soul-to-soul communication. She repeated the last two lines in a tag, contracting and expanding the tempo in ways that evoked another line in the lyrics, about a love “where there’s no space and time.” There’s no question, listening back now, that jazz is an essential part of the swirling magic that Franklin creates in that moment. But I can tell you truthfully that in the moment, among the assembled, that distinction was the furthest thing from anybody’s mind.